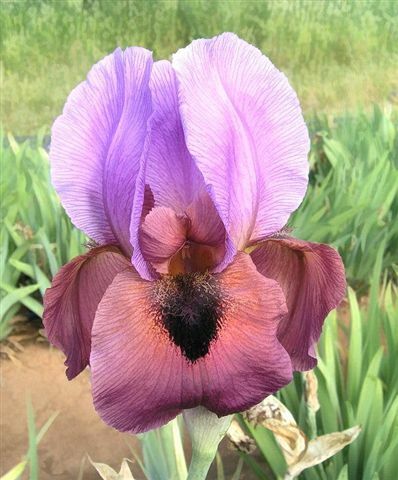 'Enchanter's Spell' (Richard Tasco, R. 2013) Seedling 07-AB-51-04. AB (OGB), 36" (91 cm), Midseason bloom. Standards bishop's-violet (RHS 81B), veined darker; style arms light orange-maize, burnt orange-brown rim, lightly veined oxblood-red crest; Falls slightly recurved oxblood-red (183C), lightly veined, signal medium sized, plush black chevron; beards gold-brown in middle and throat, burgundy-brown ends; light purple based foliage. 02-AB-26-03: ('Energizer' x 'Bagdad's Folly') X 'Kalifa's Robe'. Superstition 2013.